All Pelargonium species within section Hoarea have underground tubers and grow in specific parts of southern Africa. In South Africa, in the Western Cape, western parts of the Northern and Eastern Cape, as well as in southern Namibia. These areas are characterised by low winter temperatures and predominantly winter rainfall. However, eastern parts of the Western Cape and western parts of the Eastern Cape can receive rain at any time of year. The summers are warm and mostly very dry. In Springbok in the Northern Cape province (Fig. 1), 29.7° S latitude, day length varies between about 10 hours in the winter and 14 hours in the summer, while the average number of sun-hours varies relatively little with an average of about 300 hours per month, 400 in January and 200 in May. However, few hoareas grow fully exposed to the sun and average sun-hours may not be particularly relevant to their annual vegetative cycle. Fig. 1: The climate and average monthly sun-hours in Springbok, Northern Cape. The amplitude of the diurnal temperature cycle is consistent throughout the year (~15 oC). At the start of autumn in February, the temperatures start decreasing and minimum night temperatures can drop to below 10 oC and during dormancy, the night temperatures are above 10 oC. At the start of the growing period in February and March, the monthly number of sun-hours is relatively constant. ©https://www.meteoblue.com/en/weather/forecast/modelclimate/springbok_south-africa_3361142 and www.weather-and-climate.com, 2019. The hoarea growth season starts in the autumn with lower temperatures and the start of winter rains. New leaves start sprouting and new roots emerge from the underground tuber. Some species start to flower in early spring (August-September), while most other species follow in the late spring (October-November) or summer (December- February). Only a few flower in the late summer (March-April). Some species flower when the leaves are still green, others after the leaves have dried. When cultivating hoareas one should try to imitate the natural conditions as the plants cannot switch the growth season from winter to summer, which is an indication that there is an environmental condition that triggers growth as summer transitions into autumn, and perhaps another variable (or a combination) that triggers flowering and onset of dormancy. In this article, we explore these aspects on the basis of a comparison of two cultivation practices and natural conditions. As all hoareas start growing in the autumn, even if autumn rains are poor, it would appear that it is either low temperature, or the diurnal temperature cycle, that is the most important factor inducing new growth, and not water. An observation that supports this hypothesis is that species growing both in winter rainfall and in year-round rainfall areas start growing at the same time. P. rapaceum is such an example. 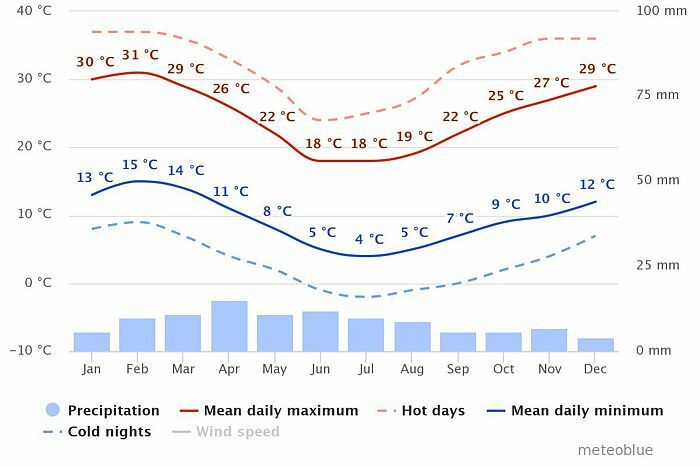 Given that the diurnal temperature variations in Springbok are the same throughout the year (Fig. 1), i.e. about 15 oC day-to-night difference, this cannot be a trigger of either autumn growth or flowering. However, further interesting insights are provided by experience with growing tuberous hoareas in different conditions. Uppsala lies 70 km north of Stockholm, at 63o N latitude. In the summer, the longest day is about 17:30 h and the shortest winter day is about 7 hours, which is reflected in the average monthly sun-hours data (Fig. 2). It is worth noting that particularly the winter sun has a very low intensity. Fig. 2: Average monthly sun-hours in Uppsala, Sweden. ©www.weather-and-climate.com, 2019. If necessary, summer is the best time to repot geophytic pelargoniums. After summer dormancy, during which the pots are kept indoors at room temperature, new growth is initiated by exposing the pots to low night temperatures (5-15 oC). This is easily achieved by placing the pots outdoors at the end of August, and watering them. Thereafter the plants are given a little water when they get drier but are never soaked in water. Most plants start growing within a few weeks and are then transferred back indoors and kept in the house in a well-lit position (Fig. 3). From November until the end of February when the sunlight is too poor and days get short, the plants are grown under artificial light for 12 hours a day and at 12-15 oC in the room generally. However as the LED lamps are only 25 cm above the pots, the plants probably experience slightly higher temperatures. The first species (mostly from the Northern Cape and Namibia) start flowering in November and begin dormancy towards the end of February. After flowering and when the leaves are dry, the pots are again stored at room temperature until August and given very little water. Fig. 3: Uppsala collection, winter 2018/2019. The room temperature is 12-15 oC, however, the plants are in close proximity of the LEDs and thus slightly warmer. Although Ljubljana is about 1,500 km south of Uppsala, 46° N latitude, it enjoys approximately the same number of sun-hours per day (Fig. 4). The longest day in the year is shorter at about 15:45 hours and the shortest one is longer at about 8:45 hours. Both this and slightly higher outdoor winter temperatures make it somewhat less costly to grow pelargoniums in a heated greenhouse in the winter (Fig. 5). Fig. 4: Average monthly sun-hours in Ljubljana, Slovenia. ©www.weather-and-climate.com, 2019. In the darker winter months (December-March), some artificial light is provided, although on sunny days, LEDs barely add much to natural sunlight. Since the minimum temperature in the greenhouse is set at 7-10 oC, there are significant variations between day and night temperatures throughout the winter, except on heavily overcast days when the temperature barely increases during daytime. This continues into late winter when the buds of early flowering hoareas emerge. P. incrassatum is the first to flower, usually in early March. Already then, temperatures in the greenhouse easily reach 25-30 oC on a sunny day, and the plants start transitioning into dormancy, when they receive very little water. The plants break out of dormancy in late August or early September, when the night temperatures regularly drop below 10 oC. This is usually the optimal time for repotting. Fig. 5: The collection of hoareas in Ljubljana in March 2019, with P. incrassatum in flower. During daytime, the LEDs provide some additional light, but this only visibly complements daylight during early mornings and late evenings. In cultivation experiments, the same species grown in Sweden typically flower at least two months earlier than those in Ljubljana. The latter appear to be flowering at equivalent times to the flowering time in the southern hemisphere. Since all the observed plants break out of dormancy in late August when night temperatures start dropping below 10 oC, why do the plants in Sweden start flowering so much earlier, with P. incrassatum flowering as early as November? 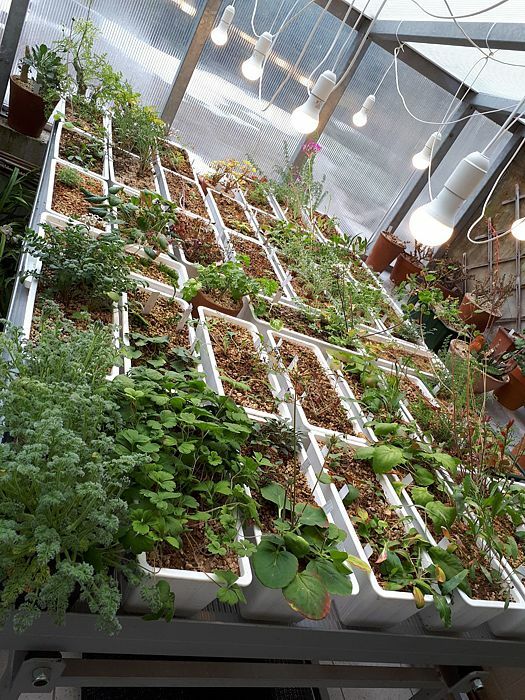 During the growing period, the plants in Sweden are kept at fairly constant environmental conditions (12-15 oC, 12 hours of exclusively artificial lighting), while those in Slovenia experience significant diurnal temperature variations with lows of 7 oC and slightly shorter days of 9-10 hours. Given that in Springbok, the diurnal variation in temperature is almost constantly ~15 oC, this parameter cannot play a role by itself. The average number of sun-hours at the start of the spring flowering period in July to September increases from ~270 to ~300, which appears to be insignificant (besides, as mentioned above, many hoareas grow in sheltered locations). Additionally, both in nature and in our cultivation experiments, winter daytime temperatures tend to be >15 oC. On consultation with other growers, the following data was revealed. In the winter of 2018/2019, P. incrassatum plants kept at 17-20 oC during the day and 15 oC during night-time flowered in January, with some inflorescences even aborted (credit: Patrice Barboutie, Paris, France). A further collection in Sweden, also grown indoors at 16-17 oC and 9 hours of artificial lighting breaks out of dormancy in October with P. oblongatum flowering in early April: a shorter vegetative period than usual, as well (credit: Pierre Christensen, Älmhult, Sweden). It would thus appear that the variable with the most significant effect on the growth patterns of hoareas is winter night-time temperature. This was on average >5 oC higher in Uppsala compared to Ljubljana, and could be the variable initiating earlier flowering of hoareas, and an earlier onset of dormancy. The same effect is seen across the spectrum of hoareas: from P. incrassatum to P. nephrophyllum, the latter flowering in July in Uppsala and in September in Ljubljana. A general conclusion from this research is that higher night-time temperatures lead to overall shorter vegetative periods in hoareas. Interestingly, pelargoniums from other sections do not seem to be affected in the same way – P. stipulaceum, an early flowering section Ligularia species, flowers at the usual time in Sweden, in March. The environmental triggers for species from different sections therefore appear to be different. By Jan Movitz, Uppsala, Sweden and Matija Strlic, Ljubljana, Slovenia. © The Authors. This work is licensed under a Creative Commons Attribution-NonCommercial-ShareAlike 4.0 International License. This article was first published in Geraniaceae Group News #153. Cite as: J. Movitz, M. Strlič: Higher night temperatures lead to shorter vegetative periods in the cultivation of Pelargonium species, section Hoarea. Geraniaceae Group News #153, pp 15-21.